Provided that you maintain it in the way that you’re supposed to maintain it, your water softener typically won’t run into any problems. However, water softeners are not indestructible. Every now and then, they will encounter problems, and will need to be repaired. To identify break-downs and problems, you need to know what problems a water softener might encounter in the first place. Without further ado, here are 5 of the most common water softener problems in Warrenville, Illinois. If your water softener requires salt in order to run properly (and it likely does), it possesses resin beads. Resin beads are key to the water softener ion-exchange process, releasing molecules of sodium while capturing particles of calcium and magnesium. While resin beads are meant to last for the duration of your water softener, they can, in some cases, deteriorate prematurely. When this happens, they will need to be replaced as quickly as possible. Usually, you can tell when resin beads have deteriorated because you will be able to see small particles floating around within your softener system. Like all machines, water softeners contain motors. In most cases, these motors will thrive for the entire existence of the water softeners. However, in some cases, they will stop working before the rest of the water softener system gives up. Usually, when a water softener motor dies early, it’s due to manufacturing malfunction. Fortunately, you can swap in a new motor whenever you’d like. If you need help doing so, you can always call a water conditioning specialist. Easily the most common water softener problem is a lack of salt. The vast majority of water softeners require the use of softener salt in order to work. If this salt is not added on a consistent basis, your water will not be softened; it’s really that simple. The good thing is that adding softener salt is very easy. All you have to do is buy some online or at a home store, and dump it into the softener brine tank. Your water will be soft again within a few hours. Like any system that makes use of water, water softeners are prone to clogging. Generally, clogs in water softeners come about due to a buildup of either salt or hard water minerals. When these clogs occur, you will experience two things: 1. A vast reduction in water pressure, and 2. A lack of soft water. These clogs most typically form in the brine line and the filter screen. While you could try to unclog them yourself, it might be a good idea to bring in a professional repair technician. One last problem you should keep an eye out for are salt bridges. Salt bridges form at the bottom of your softener brine tank, coming about as a result of a buildup of sodium. These bridges are a problem because they make it difficult for the water softener to go through its standard softening cycle. Fortunately, you can typically get rid of salt bridges by breaking them apart with a long, hard object such as a broomstick. Is your water softener experiencing a problem that you can’t fix? 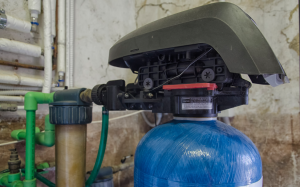 Interested in utilizing professional water softener repair in Warrenville? If so, Johnson Water Conditioning has you covered. Our team of water conditioning specialists is beyond experienced in the maintenance and repair of water softeners. We’ll have your water softener running at max capacity in no time. Contact us right now to discuss your needs!